I have yet to physically see any of my crabs crawl in or out of their salt and fresh water pools. This is not to say that they haven’t when I wasn’t looking. They’re PPs by the way. Should I set them in the water every once in a while for peace of mind or just leave them be and they’ll go in when they’re willing and ready? Re: Should I Dip My Crabs in Water? Let them go in and adjust their shell water as they choose. soilentgringa wrote: Let them go in and adjust their shell water as they choose. Thanks. In the back of my mind, I knew this was the correct response, but I just needed someone to reassure me and subside my anxiousness. Yeah, I do as well! I have yet to see any of my P's in any water, unless I startle them and they fall in. Lol. I have seen them on the sides of the pool waving their legs in it or getting drinks but never completely submerged. My straws didn't go into the water pools untill GotButterflies suggested to add bubblers. Once I did that they really hog up the saltwater pool with sand and Baby Ruth's! I usually have to change the satlwater every 2-4 days. Motörcrab wrote: I have yet to see any of my P's in any water, unless I startle them and they fall in. Lol. I have seen them on the sides of the pool waving their legs in it or getting drinks but never completely submerged. Yeah, I’ve never seen any of mine in the water. I’ve never seen mine in there but there’s always quite a bit of poo in the freshwater and a lot of sand in the saltwater. Rod must go in a lot, she’s always got a lot of water in her shell when I pick her up it leaks out. I have to change my freshwater everyday, they must throw a freshwater pool party at night. Aren’t you supposed to dip them after a molt, if returning from a isolation tank, or if you add a new crab to wash off a threat smell? RiNiKy506 wrote: I’ve never seen mine in there but there’s always quite a bit of poo in the freshwater and a lot of sand in the saltwater. Rod must go in a lot, she’s always got a lot of water in her shell when I pick her up it leaks out. I have to change my freshwater everyday, they must throw a freshwater pool party at night. Aren’t you supposed to dip them after a molt, if returning from a isolation tank, or if you add a new crab to wash off a threat smell? Yes, but only during those times. Caught him! Drinking and dipping his toes in the pools. That’s so funny! 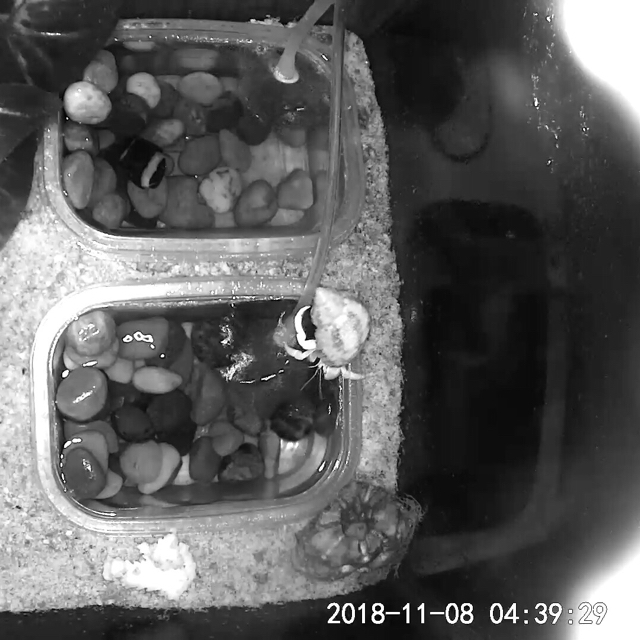 I finally hooked up my camera last night and I caught one of mine dipping their toes too! It’s funny bc we were just talking about it. 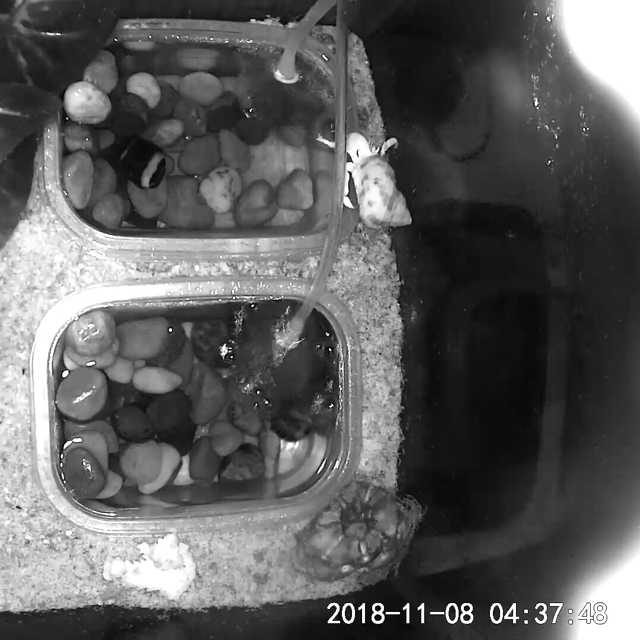 I can’t tell who it was, it’s hard to tell who is who in the night vision. RiNiKy506 wrote: That’s so funny! I finally hooked up my camera last night and I caught one of mine dipping their toes too! It’s funny bc we were just talking about it. I can’t tell who it was, it’s hard to tell who is who in the night vision. That's the only thing I don't like about the cameras. The colorless night vision.